A few years back I had the opportunity to watch one of Ray Bradbury’s radio plays performed live in a small theatre in Los Angeles. It was a real treat. So, when I heard that WildClaw Theatre was presenting Deathscribe 2010: The Third Annual International Festival of Radio Horror Plays I knew I had to share it with you. If you’ll be in Chicago on Monday, Dec. 6, I recommend you grab yourself some tickets to this show at the historic Mayne Stage Theatre. Admission is only $20, so it is kind of a no brainer. 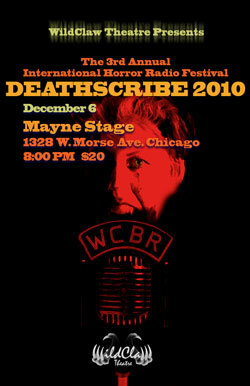 Harkening back to the Golden Age of Radio, Deathscribe 2010 will present five original horror radio plays, chosen from nearly 100 international submissions, and performed by some of Chicagoâ€™s finest actors, with a live band and dueling foley artists. There will be a “Best of the Fest” award, the Bloody Axe, chosen by a celebrity panel of judges, plus special surprise guests, and the entire performance will be recorded for a future WildClaw Blood Radio Podcast.